Need a simple side dish to go with dinner? 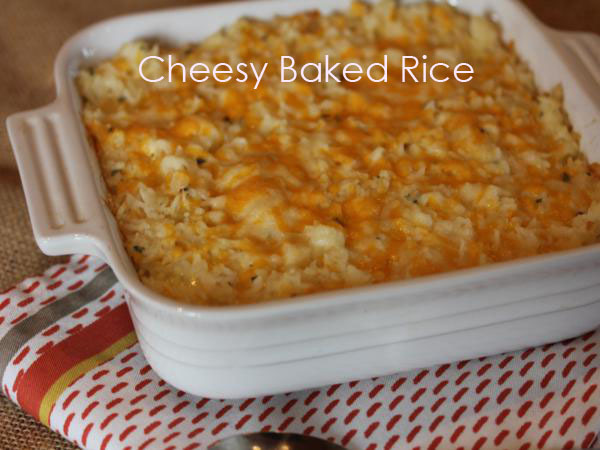 Cheesy Baked Rice is an easy side dish to make. It works with all kinds of different meals and is a great way to use leftover rice. Side dishes can often be boring and plain. And if your house is anything like mine, they are often the same side dishes over and over again. Side dishes are where I definitely lack creativity. 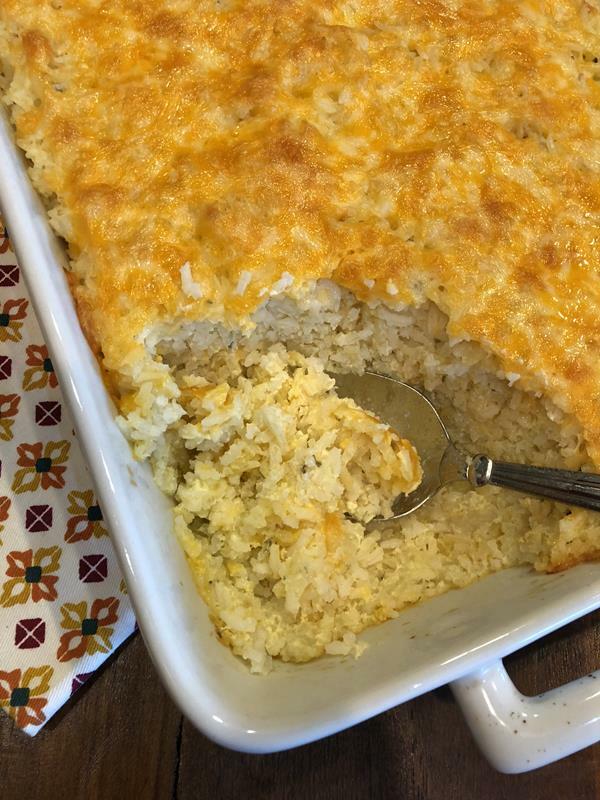 This cheesy baked rice recipe I am sharing today is not exactly super creative, but it is simple and delicious. 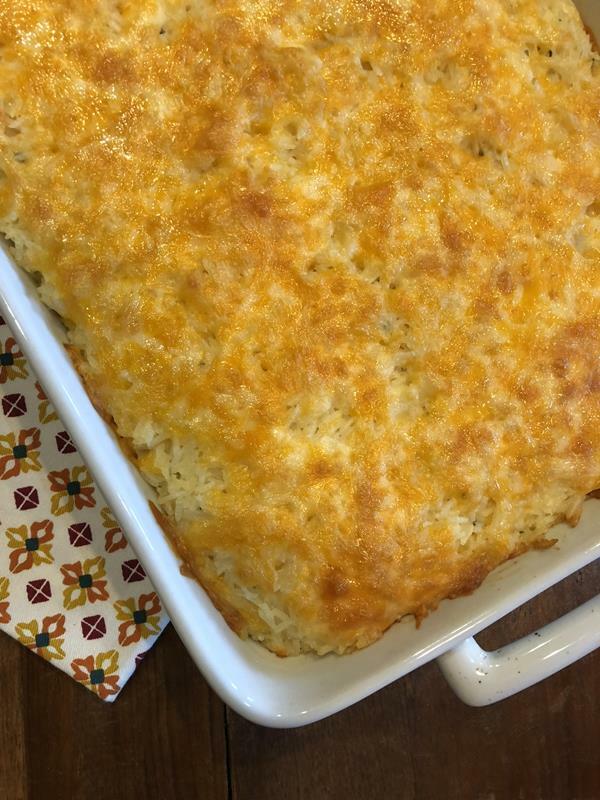 This is one of those side dishes that I can serve my family over and over again and they won’t get tired of it. It is simple, delicious, and budget friendly. I love the fact that it is not only quick and easy to make it is also versatile. I can serve it with roast, with pork, with eggs for more of a breakfast for dinner, or even as a main dish with a little bacon or sausage added. This is also a great way to use up leftover rice. Or plan ahead and make extra rice one night and use it in this recipe later in the week. This is one of those recipes that I think you find yourself turning to over and over again. The recipe makes an 8×8 pan, but I often double it and make it in a 9×13 so that I have leftovers for lunches. In a bowl mix all ingredients using only half the cheese. Spread into a greased 8×8 pan or similar casserole type dish and spread remaining cheese on top. Bake at 400 for 20-25 minutes or until heat through and cheese is nice and melted. I would LOVE to see ways to spruce up veggie and more side ideas. I’m very boring when it comes to sides/veggies. I think you could easily add some veggies to this and it would be great! I’m going to try this tonight with leftover turkey and peas! made this tonight and it was pretty bland for us but a great base for a good dish! Thought maybe toss in veggies next time, maybe some crumbled bacon, etc. But it was a great consistency! Thanks for sharing! Thanks for such a great recipe! Made it with a mountain of leftover rice I had and my picky family loved it!! I used 1 tsp. each garlic powder and onion powder in place of the season salt and some of my family sprinkled their serving with bacon bits! I also used shredded velveeta mixed with the rice, instead of the cheddar. Definitely a keeper! I love how you changed it up! It sounds really good. I am glad you all enjoyed it. I add frozen broccoli to this and it was great. The recipe calls for cooked rice so no additional water is needed. I’m making this for dinner and added in some sliced D’artagnan chicken and truffle sausage to make it a whole meal. I’m super excited to try it! Thanks for an easy recipe. It’s great by its own surprisingly! I made the dish and it’s simply amazing. Thanks for sharing this recipe❤️! I’m in highschool, and I made this for a community potluck, because my mom was busy with stuff and couldn’t make a dish to bring. We didn’t have parsley, though… But it was a hit at the potluck! Now I’m thinking of ways to change it, or things to add to make it even better! I am so glad that you enjoyed it and that it was a hit at a potluck! Yes, there are lots of ways that you could change this up and add other things to it. It is pretty basic so you could do all kinds of things to it flavor wise or add something like meat to make it a main dish recipe. And I love hearing that you are in high school and enjoy cooking. Good for you! It is a skill that you will use for life. This was not a hit I’m sorry to say. Was very dry and bland. Maybe better with some butter? Seems it needed something else.